Editor’s disclaimer: All of which you are about to read is 100% real and 100% happened. It might not seem that way because it is all so absurd, because it was gone just as fast it came, because no one has addressed this, not even on the meme page, but it did in fact happen. 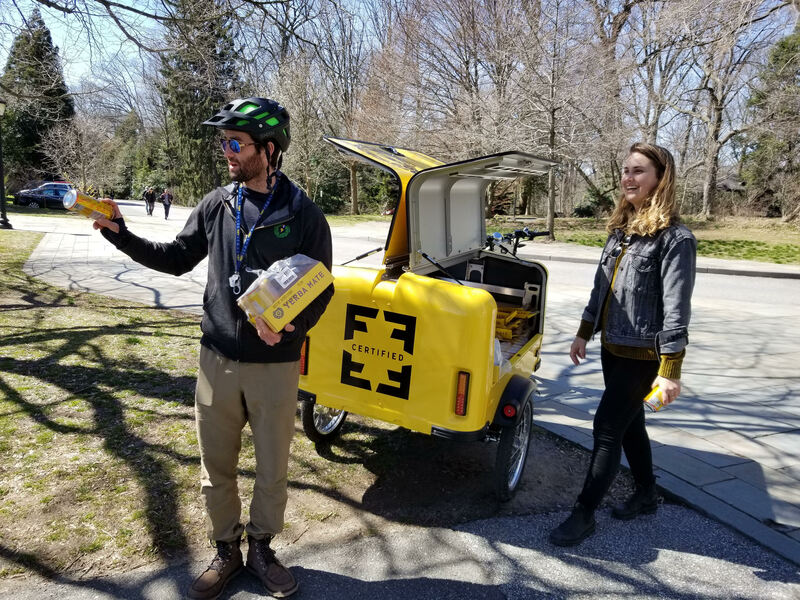 On Tuesday, March 26, for a brief few hours, Mate (pronounced ma-tay) became the most popular drink on campus. Though not sold at Essie’s nor on tap at Sharples, tall cans of ornately decorated Guayakí brand Yerba Mate were ubiquitous in every classroom, library, and social space throughout the day. The forces behind the phenomenon were two abnormally cheerful promoters of the beverage, bearing the title “Trikador” proudly. Mate is a traditional caffeine-rich infused drink that is common in South America. It was first created and consumed by indigenous people, particularly the Guaraní and the Tupí people. Guayakí, founded in California in 1996, is an organic beverage company that focuses primarily on Yerba Mate. It prides itself in its “Market Driven Regeneration™ business model” of social involvement in local communities. “Mate is shade grown, so market demands helps to reforest rainforest,” explained Seguin. Seguin became a partner of the company six years ago, four years into his decade-long cross-campus journey. The California-based company hails from an environment where Mate seems to be a lot more popular according to Seguin. The drink that Seguin came to campus to proselytize is, according to Seguin, the most nutritious form of caffeine one could drink. 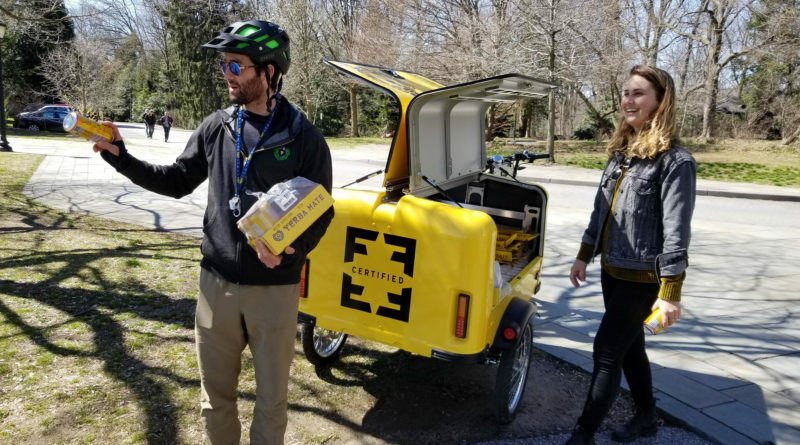 The company uses this form of promotional marketing extensively, sending Trikadors all over the country to different areas and campuses. “We call it Toucan marketing,” said Seguin. This is an intricate pun on the term “guerrilla marketing” (which sounds like “gorilla marketing”), because as opposed to the gorilla, Toucans are the birds that germinate the Mate seeds. “Toucan” also sounds like “two can,” referring to the multiple cans of Mate that they distribute. “This is the most effective way to market a product,” said Seguin. The two Trikadors did not let the lack of official permission from the school get in the way of their mission to distribute free Mate and increase “Mate-awareness” among the student body. After a good day of work, and a job well done, the two continued their mid-Atlantic college journey to Bryn Mawr, soon to be followed by UPenn, Princeton, and Rutgers.